Ed Nelson was a Forward for the UConn Huskies from 2003 – 2006. He was a member of the National Collegiate Athletic Association Championship Team in 2004. Ed transferred to Connecticut after attending Georgia Tech University where he was the 2001-2002 Atlantic Coast Conference (ACC) Rookie of the Year. I had the pleasure of talking to Ed in January 2007—by phone from Finland, where he is playing basketball— about his basketball experiences, his time at UConn, and his National Football League experience. Ed spent his early childhood years in Brockton, MA where he was born. He enjoyed playing all sports but at around the age of nine, Ed could already see that he was bigger than most of his friends. “That’s when I kind of thought it out that I was going to become good at basketball, and grew to love it.” At the age of 12 his family moved to Fort Lauderdale, Florida. Ed continued to play football and basketball through his freshman year of high school when he decided to give up football because the football season overlapped with the basketball season. Ed went to Saint Thomas Aquinas High School where he enjoyed many accomplishments. As a sophomore his basketball team reached the final four in the state championship tournament. Ed was becoming a good basketball player, and after his sophomore year was invited as one of the top 50 players in the country to play in the USA Development Festival in Colorado. “I actually broke the scoring record, scoring 41 points in one game. That kind of put me in a good position for my junior and senior year where some polls had me ranked among the top 25 players in the country.” A week later Ed had recruitment letters from almost every school in the country. As a junior, Ed continued playing well and helping his high school team to reach the championship game of the state tournament. He also narrowed his college decision choices to Georgia Tech University, Kentucky University, Boston College and Notre Dame University. After completing his recruiting visits, he chose Georgia Tech because it was only an eight-hour ride for his family to see him play, and Ed felt the ACC was the best conference (at the time it included current National Basketball Association players like Jason Williams and Carl Boozer). He committed to Georgia Tech during the early part of the signing period because he wanted to enjoy his senior year of high school, and focus on winning the state championship. As a senior the team won the state championship tournament, and Ed received the honor of being most valuable player of the state tournament in addition to being named Florida Player of the Year. Ed also had fond memories off the court; living only 10 minutes from the beach, he and his buddies often went to the beach after school, worry free, having a good time. When Ed arrived at Georgia Tech, the transition from high school to college was significant. “You have to go to practice, then watch film, then study, no more going to the beach.” Ed worked hard his freshman year, and with good results. He averaged 10 points and 7 rebounds, and was named Rookie of the Year in the ACC. His sophomore year the team had met some bumps in the road, and Ed wasn’t enjoying himself. “I was happy on the court but off the court was a situation I just wasn’t happy with. I thought it would be best to relocate.” Most of his family was in the Boston, MA area so he decided he wanted to play in the Northeast. Ed chose UConn because he knew Emeka Okafor would be leaving college early for an NBA career. Ed wanted a year working with Emeka to polish his own game, and UConn was expected to have a great year. And the team did, winning the National Collegiate Athletic Association Tournament. 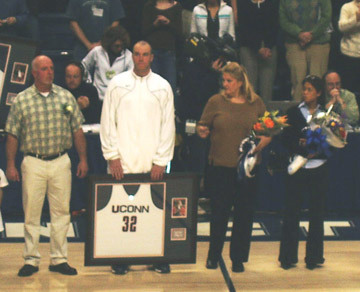 Games that Ed will always remember from his UConn experience include a game in the second round of the 2005 NCAA tournament against North Carolina State. Ed had a great game, and was player of the game but NC State scored a lay-up to win the game, and end UConn’s NCAA run. “It was a devastating loss that I’ll probably never forget.” Another memorable game for Ed was senior night. “I played about 18-20 minutes, and all my family was there and the senior night pre-game presentation is memorable. It was the conclusion to my college career. It was perfect, and I had the three people I love most on the court with me, my mother, father, and girlfriend Milan whom Ed met his first day at UConn during orientation. Ed graduated from UConn with a Bachelors Degree in Political Science, and has been very busy since. He had completed summer internships at the State Capital working for Governor Rell, and a few of the state’s senators so he knew he could start a professional career there. He also thought about a professional basketball career in Europe, and surprisingly football came back into Ed’s life. National Football League agents had been calling Coach Calhoun with interest in Ed to go to some pro football workouts. “It was literally four days after basketball season was over, and I thought, why not explore my options?” Ed spent the next couple of weeks working on football drills. His agent thought he’d be signed to an NFL team during the draft. Although Ed wasn’t selected in the draft, two minutes after the draft finished Ed received a call from the St. Louis Rams. They picked him up as a free agent. “I got a sign-on bonus, and a two-year contract with the Rams.” Ed still had to try to make the team so he went to camp. He worked hard, and did well but Ed made the decision that there was just too much to learn, and basketball was his real passion. Four weeks later, Ed went to Italy to play basketball in a showcase for European teams to view your skills. 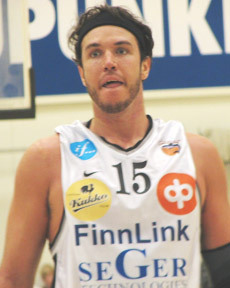 He played well averaging 21 points and 10 rebounds, and signed a contract with a team in Finland called Korihiat.